Nearly two months have passed since Hurricane Harvey drowned the upper Texas coast. There have been numerous public hearings, state meetings, and some squabbling about who should pay for cleanup, reconstruction, and mitigation. We have included each of Emmett’s 15 proposals below to spur the community discussion. There are a lot of good ideas here. One of the things that makes the most sense, from our perspective, is the creation of a regional floodwater management organization that would consist of representatives from area cities, counties, and other government organizations. Such a body could take a holistic approach to flooding, which is truly a regional problem, identify problems, find solutions, and then present them with a unified voice from the greater Houston community. The biggest problem is that enacting a lot of these ideas will require cooperation between city, county, state, and federal officials. The political environment for such cooperation seems poor at this time, but Emmett is correct that if the region does not act now, Harvey will fade into memory and Houston will remain as vulnerable as ever to flooding. Ultimately, making a lot of these changes will require pressure from citizens, civic organizations, non-profits, and those who take the long view that Houston should be a great, livable city for decades and centuries to come. Create a regional flood control/water management organization similar to the Transportation Policy Council at the Houston-Galveston Area Council. This will allow for multi-county coordination of flood control and water management. FEMA flood plain maps need to be revised immediately to reflect the impact of Harvey. Development rules should focus on restricting development in the 500-year flood plain instead of the 100-year flood plain — or the 100 year flood plain needs to be vastly redefined and updated. A third reservoir should be built to protect the west and northwest sections of Harris County. Rather than waiting on federal funds, the reservoir should be funded by the State of Texas’ “rainy day fund.” The reservoir should be part of a larger project to create a state or national park for the Katy Prairie. The U.S. Army Corps of Engineers should immediately fund the four Harris County Flood Control District projects that are now ready for completion. Those four are Brays Bayou, White Oak Bayou, Hunting Bayou and Clear Creek. New flood maps showing the impact of these projects should be released so homeowners will know if their property will remain flood prone. Old watersheds in developed areas in Harris County should be identified. For example, those areas downstream from Addicks Reservoir need to know where an “uncontrolled release” over the spillway would flow. The Harris County Office of Emergency Management, working with municipalities and special districts, should develop a state-of-the-art flood warning system and localized evacuation plans. Such plans should use recognized volunteer organizations to assist first responders. 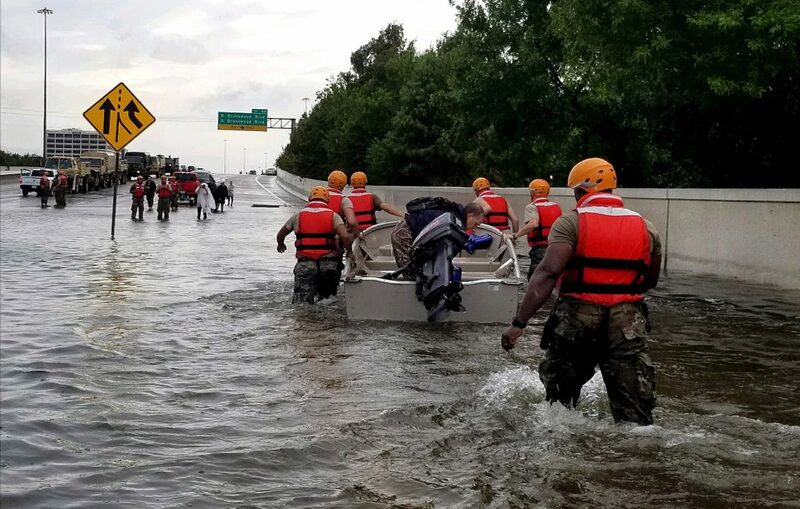 The Harris County Sheriff’s Office and the Community Emergency Response Teams should have a defined water rescue effort featuring private boats and high-water vehicles. Lake Houston and Lake Conroe should be converted to serve as Flood Control facilities in addition to serving as water supplies. Lake Houston should be restored to maximum storage capacity, and the San Jacinto River Authority should create retention/detention capacity upstream of Lake Houston. And the San Jacinto River Authority should have representation from Harris County. The Harris County Emergency Operations Center should be expanded to assist emergency operations for smaller surrounding counties. The roles and responsibilities of municipal utility districts and other special districts should be clarified to include flood control and storm water management, in cooperation with the Harris County Flood Control District. Existing districts should be studied for untapped capacity, and new districts developed with flood control in mind. Until a true 100-year flood level is defined, the 500-year level should be used for detention purposes. All underpasses that have the potential for drowning should be identified and equipped with automatic barriers or be part of a comprehensive manual plan for closures. In addition, vehicle manufacturers should be encouraged to develop technology to detect high water. The Harris County Flood Control District should develop comprehensive plans for every major watershed in Harris County, with immediate attention given to the entire length of Buffalo Bayou and to plans to divert storm water around downtown Houston, either through a canal or tunnel system. Federal, state and local governments should implement a buyout and/or elevation program for all homes located in the 100-year flood plain or that have flooded repeatedly. Such a buyout/elevation program should use traditional government funding and private funding, such as social impact bonds. The State of Texas should institute clear rules for approval of development plats in unincorporated areas, specifically those areas in the extraterritorial jurisdiction of a city. Additionally, there should be clear requirements for disclosure of flood risk to homebuyers and renters. The U.S. Army Corps of Engineers should restore the dams and detention areas of Addicks and Barker reservoirs to first-class condition including, if necessary, removing dirt and vegetation within the reservoirs. Given the population of unincorporated Harris County and the restrictions on incorporation and annexation, Harris County should be allowed some ordinance making power and should receive a portion of the sales tax collected in unincorporated areas. To continue to exclusively rely on the property tax is fundamentally unfair and unsustainable. While I think it entirely possible to get the City(s) and County(s) to cooperate… I don’t see Austin being so amenable, nor D.C. Hire rice farmers to put a levee system (like in rice fields) in every vacant pasture and area within the watershed. These are equivalent to 30 inch deep reservoirs that would prevent downstream accumulation and flooding. Point number 1. Realistically define 100 year flood plains and appoint a panel of experts to come up with this. I am convinced our 100 year flood plains maps are seriously flawed and it may have something to do with politics. I do not care about probabilities and the like, but when you flood 3 times in 10 years, you are not outside the 100 year flood plain. Indeed, you are probably within the 10 year flood plain. If a place floods every three years, there shouldn’t be a house there. Unless it is on 10′ stilts. But the houses did not flood until the uncontrolled greed of the government and land developers led to irresponsible over development. I have never seen an elected official withstand the temptation of collecting another dollar of tax revenue. Before you tear my house down, go tear down some of the ones built in the last 10 years which caused mine to flood. Unfortunately, as a land surveyor, one thing I often stress to clients is that the food maps may be incorrect, but they are official. With the data being so horribly wrong, as we’ve seen repeatedly, there is really no current way to delineate correctly where someone *should* be allowed to develop. It’s a horror show. The annual chance rain estimates used for the floodplain maps might be an underestimate. For one thing, there are only so many years of record for our rainfall, and perhaps it’s a sample size too small to confidently define the 1% and 0.2% annual chance rains. For another, we don’t know that the likelihood of these intense storms hasn’t gone up over time. Even if you just add in the events from Allison to Harvey to the current analysis, you might still be underestimating if the older data is describing a time when the risk was genuinely lower than it is today. There’s a lot of talk of “we’ve never flooded before, it must be the developers” but in a lot of cases it’s raining like we haven’t seen before. Also, keep in mind that the mapped 100-year floodplain is only meant to show the risk of flooding from streams coming out of banks and coastal flooding. Other sources of flooding, like a neighborhood that can’t drain water to a stream faster than the rain puts water into the neighborhood, won’t show up on a Flood Insurance Rate Map even where it happens a lot. Long story short, buy flood insurance. I would love to see these things happen. However, I don’t believe that the developers (and the pols who welcome the developers’ dollars) would be willing to let this make much headway. Memories are short, and there are hundreds of billions of dollars of real estate that developers are eyeing right now. I hope Emmett can keep this in the public’s mind, but I’m not particularly optimistic. Those are all great suggestions and I hope that they are carried out. He is right about not waiting and his points are well taken. I would like to see a 16th bullet that includes zoningvstanards, such as the use of pervious concrete, water resitant wakeboard in homes, etc., and a 17th bullet around strengthening our fragile electric power grid. Looks like a plan, especially keeping developers from stuffing large homes 6′ apart from each other on under-sized lots and doing nothing about the drainage (think inside 610 – – like Midtown or Heights). The problem is, this will cost money. A lot of money. My experience over the last 36 years of living here is that most people are too cheap to invest in infrastructure through taxes (look at our highways) or higher home prices and when our politicians get their hands on money they would rather spend it on hand-outs (with construction money going to their brothers-in-law). It’s going to take some major paradigm shifts to get this done (and perhaps a new set of leaders). Adding to the problem is that the City of Houston is now some $12 BILLION in debt (depending on how you count the pension time bomb) and is starting to head down the same fiscal path as Detroit (in fact Houston now has more debt than Detroit). Well, you guys can figure this all out, I’ll be living elsewhere (somewhere where there is no tropical weather) well before the first project finishes. Maybe even before so-and-so’s brother-in-law is awarded the first contract. Setting up an organization will likely lead to waste and time lost. A third reservoir should be priority an slow building along 290 past 99 until water retention ponds are developed. Using lake Livingston and Conroe will lead to the same flooding happening along san Jacinto river area. Rainy Day fund? Houston’s flooding is a Houston problem, not a Texas problem Sounds like a Sylvester Turner solution. With respect, Houston contributes about 30% of Texas’s GDP. This is absolutely a Texas problem. I disagree. This affected much of Southeast Texas/Gulf Coast, some far worse than Houston. I-10 East was an inland ocean. Rockport was devastated. This was a Texas problem. The Army Plan (1940) would have provided a North and South Canal and a White Oak Bayou dam. I suspect that this would have handled Harvey – would have been able to drain Barker & Addicks dams and avoided the Meyerland flooding ……. but in 1954/55 there was “lack of local commitment” … the Army required matching funding or similar. As a result only Barker & Addicks dams along with the improvement of Buffalo Bayou to West Belt (where the South Canal was to start) were completed and the rest is history. We should perhaps look back to that plan and see if we can come up with something that would do a similar job. Colin – I’d like to read up on this history. Where can I find some references? Thanks. Gayle- Don’t worry about being cynical about our politicians. I’ve been cynical about our city and state government for decades now, and I’ve recently added the county and the average voter to the list as well. Time to move to Switzerland, I think. There are several good suggestions by the judge, but as the Corps’ brain trust will tell you (and him), there are no “flood CONTROL” solutions, only flood damage REDUCTION solutions. In addition, the Corps’ funding request for Fiscal Year 2019 (which begins Oct 2018) is already prepared, is under review, and goes to Congress the first Mon in February 2018. Annie, Houston is Texas’ biggest city, of course this is a Texas problem. Everyone saying “It is a Texas problem” I would bet said “idiots shouldn’t live in a bowl” when Rita messed New Orleans up. I’m sorry but the people who bought these homes in the flood plains and homes downstream of dams/reservoirs were either people who seen a good deal on a home and gambled, or didn’t take two seconds to research. True those homes should not have been built there. Still comes down to the buyer should have done better planning and research before investing in them. I like all of these points. I would love to see the high water barriers at underpasses come into effect. They would save a lot of lives. I’m not sure what it would look like, but it would be nice to see some more help also go to groups involved in prairie and wetland restoration. There are a lot of projects all over the city creating swales, wetlands, and other features to catch water and slowly filter and release. These kinds of projects help prevent the enormous sediment loads from dumping into the channels, bayous, and Bay while also being environmentally friendly and nice to look at. Who is producing good numbers on Harvey? They seem to keep changing and I haven’t found a consensus source. In order to assess future preparation recommendations in the context of Harvey, we have to have some corresponding agreement on what the actual damages were, and it’s a highly politicized subject, so the claims have to be vetted. No valuation can be attached to recommendations even to a first approximation without reliable data. A very big deal was made about the Tax Day flooding, but I later read that it only affected 2% of Houston’s housing stock (today I cannot find that reference to see what source claimed that, because it’s buried somewhere on the internet). Well, how did the cost of the corresponding recommendations then compare to the costs incurred by damage to 2% of the housing? If we have a data set, we can compare the costs of various proposed actions against the costs of inaction (what I just described is really a core principle of the National Environmental Policy Act (NEPA)). But without a full data set, it’s all just arm-waving. 15 points? Let’s condense them – First, whoever in the City and/or County that signed off on developing the areas around water control systems needs to be fired and sued, and if any are professionally certified, that needs to be revoked, ASAP. Second, using the power of deed restrictions, all future development plans in 100/500 year zones need to be stopped. Period. Third, bring the SJRA under heel. Now. The various bodies of water around the Houston Metro need to be tied together for proper flow control. Do that, and we’d be off to a good start. Whining about zoning or prairies (which, BTW, would be underwater) is somewhat silly. Perhaps stop removing soil and replacing it with concrete. In other words. Stop building. Tear down abandoned areas and reuse them. Stop removing the soil. Why did Harris County Flood Control sell all their Equipment in the 80s and quit digging ditches. In the 80s most ditches were dug every 5 years,look around your house and see when Flood Control last dug the ditches. All citizens of Harris County please read the Harris County Commissioners minutes twice a month and see what needs funded and what they fund. Get informed and make Harris County better. Remember all the big 25 % + 25% +11% raises they give themself talking about what good job they are doing. Some of the ideas have merit, however others are simply pipe dreams that would cost an unimaginable amount of money to accomplish (example – turning Lake Houston and Conroe into flood control reservoirs instead of water supply reservoirs). I’m not personally sold on the 3rd reservoir either. A major component of the flooding stems from development – we are channeling more water over a larger area into the same drainage channels that were designed by nature for a significantly slower runoff. At some point you have to realize that there are simply limitations on what the natural basis and watersheds can handle. The more of the old Katy and Bay Prairies that we develop, the greater the volume of runoff becomes. And that runoff still channels to the same creeks, bayous and rivers. The channelization of the rivers – especially the Brazos via the levees built on either side in Richmond, also contribute to the flooding in a substantial way. Changes need to be implemented, and some of the ideas are probably really good ideas, but many of them on Emmett’s list are simply unrealistic or are ignoring the actual crux of the problem and instead just trying to find a more expensive solution. I fully realize how much property was destroyed and loss of life and it is truly tragic. I do believe we need to make sure we keep this in perspective. This was the single largest rainfall event ever recorded in the USA. I am not sure there is a city anywhere is the world that was designed to handle 57″ in 4 days much less a city that is basically flat with clay soils. I personally think that Greater Houston held up remarkably well. We can also do better and Judge Emmett’s plan are great improvements. Use rice farmers to terrace the countryside into terraces like they do in rice fields to capture water and prevent downstream flooding.